KP Events once again helped international IT company Wipro work with its UK partner this year Npower to stage the UK legs of their SPIRIT OF WIPRO runs which take place on the same day globally, this year on SUNDAY SEPTEMBER 20th and in 2015 these were held simultaneously in Leeds and Solihull with hundreds of employees with their friends and family turning up to enjoy the festival atmosphere in the late summer sunshine. KP Events director Paul Griffin summed up the success at both events: “We have worked with WIPRO now since 2013 and each year the UK events grow and grow, everyone is so enthusiastic and we have children as young as four taking part, we have face painters, bouncy castles as well as refreshments laid on for all participants and the atmosphere is just so unique, we all thoroughly enjoyed ourselves and we look forward to having a 3rd event in 2016 in London”. Pictures show the start at Leeds Spirit of WIPRO with the 3 male winners of the 5k. 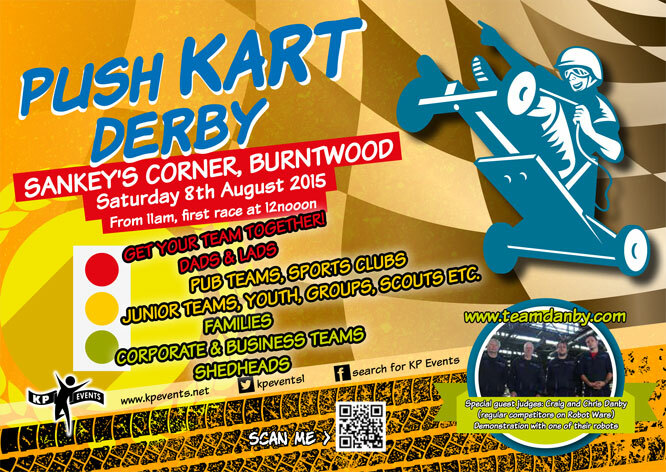 The Burntwood Wakes Push-Kart Derby – 8th Aug 2015, Supported by Burntwood Town Council, 11 a.m. – 5pm. 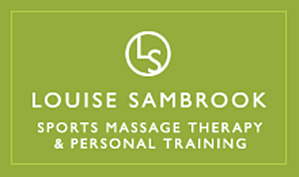 Venue: Burntwood High Street Sankey’s Corner / Burntwood Shopping Centre. Course: Two adjacent flat 100m straight runs for non-powered karts which can be pushed or pulled. Technical Consultants / Judges: Chris and Craig Danby of team Danby Burntwood based Robot Combat Team, stars of TV’s own Robot Wars. Entry Fee: £5 per team and all proceeds go to local charities. Junior teams, schools and child based teams/youth groups scouts etc. 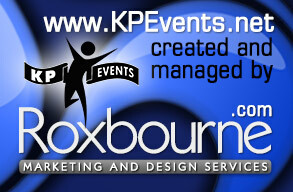 Corporate teams, any companies who want to enter or rather teams representing a company. Teams can consist of any number of people BUT in the race element there has to be the nominated driver and 3 push/pullers maximum. The push kart must have steering. The push kart must have brakes. 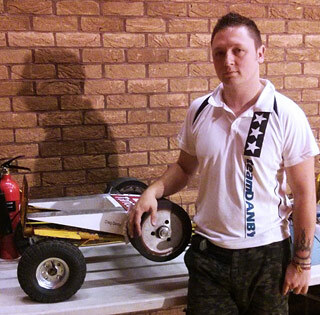 The push kart must be no bigger than but may be smaller than 2m long by 1.5m wide and 1.2m tall. Any cover/body must be firmly attached to the push kart and considered to be safe on inspection. The push kart should be made strong enough to withstand several runs of the designated course. The push kart must have 4 wheels. Drivers must remain seated at all times during the event and seats must be securely attached to the push kart. The minimum driver age is 14 years old. All push karts will be subjected to scrutiny for suitability and safety to take part, before being given a competition entry number. The competition will be based on a time trial event, you will race down the course a set number of times and the team with the lowest combined time will win. All drivers must wear helmets and be fully covered (long sleeves and full length trousers) to be allowed to run the course. 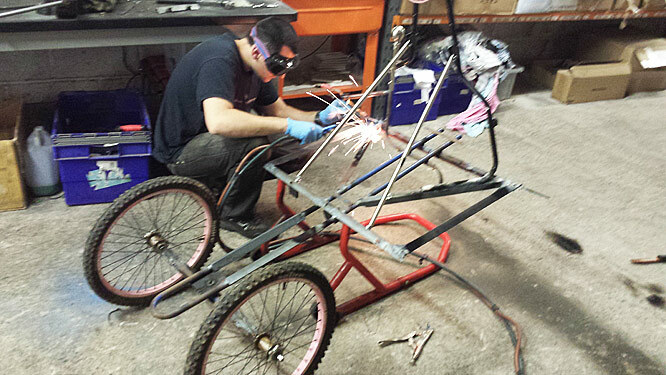 It’s nearly time for the Burntwood Wakes Push Derby and the team from Burntwood Leisure Centre and Speedway Motorcycles are hard at it welding, bending and hearing bits of metal to form their wondrous creation (see photo below). 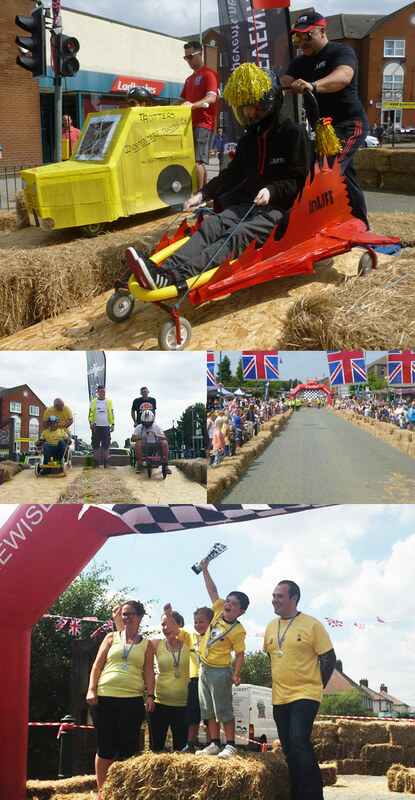 There’s ttill time to get your team involved, so come on kart builders everywhere. 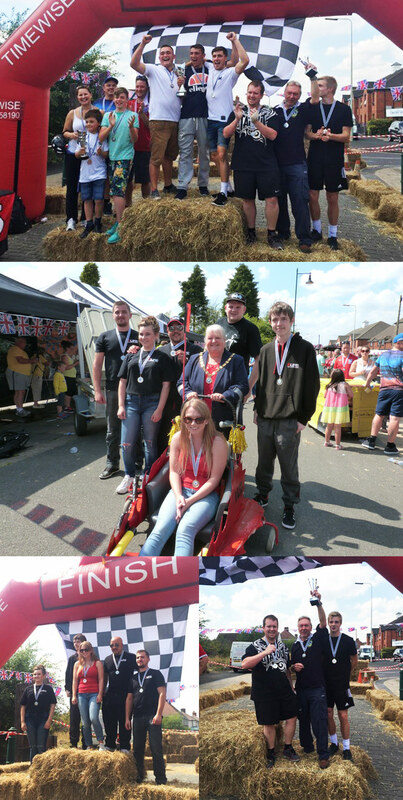 The 2nd Big G Challenge in honour of the late Geraldine Chapman was a big success on Saturday June 13th and her friends at KP Events were very happy to play a small part in making the day go so well. Well done all concerned. 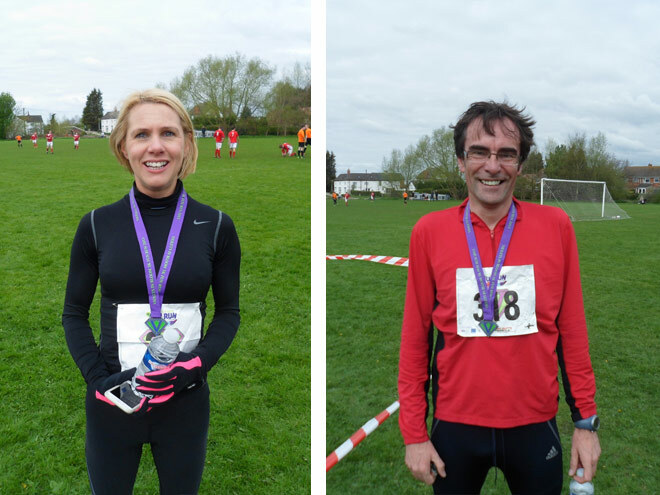 You can see the full Results of the Lichfield Half-Marathon May 2015 here on STUWEB. The 5th annual Lichfield Half Marathon sponsored by Running Form and Virgin Holidays was won by Matthew Missen (Birchfield Harriers) from Lichfield, winning comfortably in a time of 1:14:13. The day opened up rainy and windy but finally dried up almost exactly as the race started. 1200 starters set off from Lichfield towards neighbouring village Whittington. Matthew Missen and James Trollop (Lichfield Running Club) vied for the lead before eventually pulling away at around 8 miles and never looked back. Second home was Richard Powell of West Bromwich Harriers in 1:16:40 with Stuart Lumsden of Northbrook AC in third at 1:20:23. First female home was Mel Woodward of Sutton Coldfield AC in 1:22:29, with Hannah Howard of Eastleigh Running Club second in 1:23:39, and Sarah Dauncey third in 1:30:35. YOU CAN SEE PLENTY OF PHOTOS OF THE HALF-MARATHON HERE. Photos provided courtesy of David Blood. ALSO, there are more photos to view and buy HERE. Photos by Steve House. 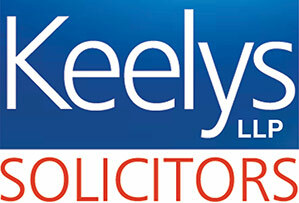 13th JUNE 2015 START 10.30AM, HORSE & JOCKEY FREEFORD, WS14 9JE, in aid of Headway. DONATE TO THIS CAUSE on the “JustGiving” website HERE. 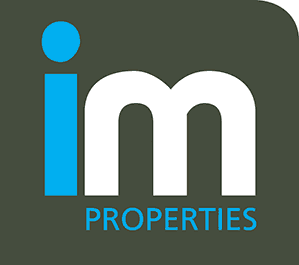 Fancy a challenge with a difference? Rally your family and friends and enter as a team or as an individual effort! 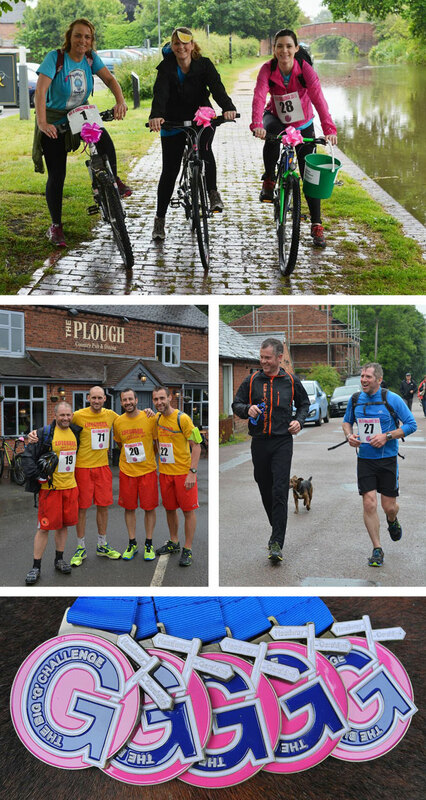 The Big G Challenge is a circular route around Lichfield of marathonesque proportions which can be completed as an individual or as a team effort, covering the distance as a relay – you can walk, run, yomp, cycle and even canoe at our second annual Big G Challenge. This is a fun event with different challenges along the way – including 4 designated pubs with challenges at each – also makes easy changeover if completing as a team effort. Many prizes on offer including Best Fancy Dress, Best Selfie, Best Team Name. There will be a post challenge party and hog roast at the Horse and Jockey at 7pm – this is no ordinary event – expect the unexpected! Sponsored by RUNNING FORM – Running Shoes and Apparel – online and shop in Burton. 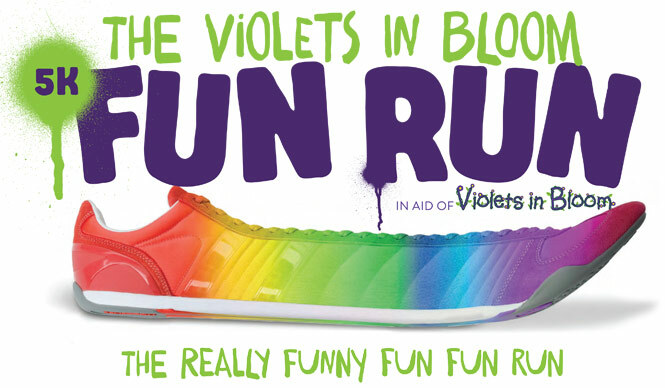 Violets in Bloom 5k Family Fun Run – 19th April 2015, sponsored by Dan Berry Freestyle MA Academy and supported by the M6 Toll and Citrus Research. This is one for all the family. 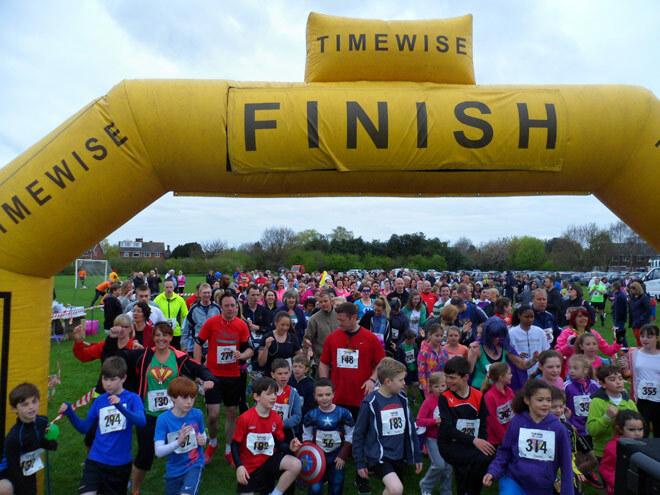 A fun and friendly 5k event that you can run, jog or walk in Alrewas, Staffordshire. The full results are HERE on Stuweb. You can view and purchase photos of this event HERE, use Fradley15 as the password. Photos by Curley Photography. 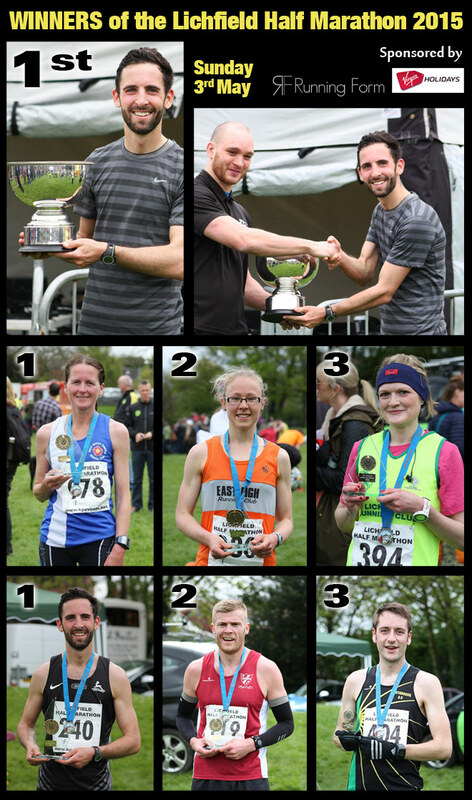 Lichfield athlete and Lichfield Running Club member James Trollope repeated his 2011 win at today’s Florette Fradley 10k (picture top left). 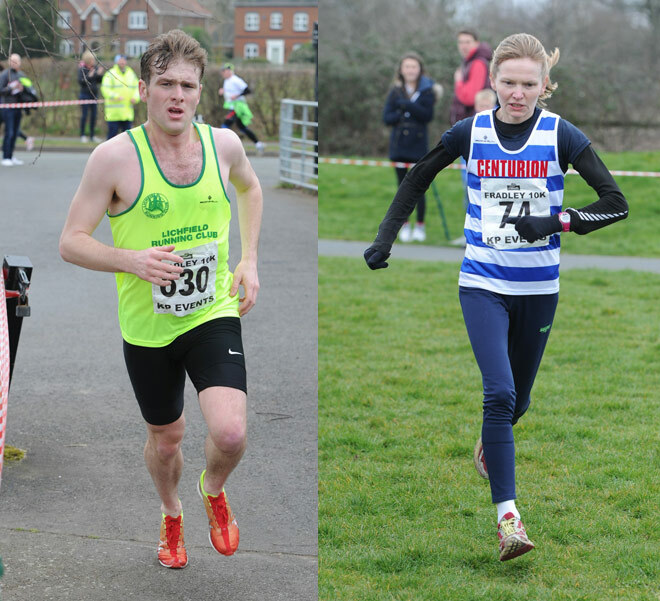 A near 1,000 strong field braved the cold but dry conditions and Trollope immediately headed the pack from the gun and swooped home in an excellent time of 32:20, slower than his 2011 time of 30:50, followed home by Matthew Missen in 33:11 with Aaron Brown (Cannock and Stafford AC) 3rd home in 33:14. A feature for the event this year was a contingent of over 20 runners from sponsors Florette and their Team Florette (pictured below centre) with Chadi Amoun finishing overall 11th and Joanna Simpson finishing 2nd female home; showing real commitment from a sponsor’s team. The Fradley Fryer Junior 2k race was won by Ben Edwards in 7:11 ahead of Lee Haymes in 7:34, first girl home was Sian Edward in 8:36.